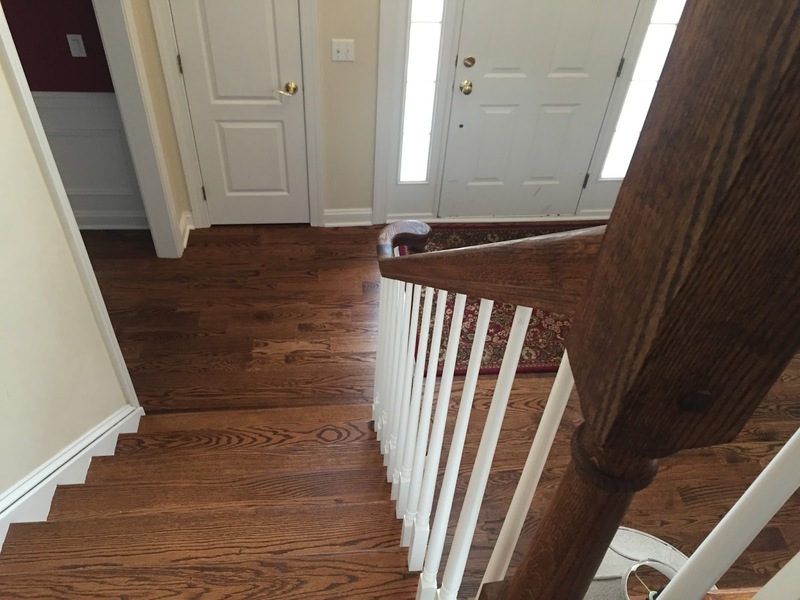 During our recent renovation, we removed our carpet runner from the stairs, refinished the oak with a darker stain and replaced the spindles with white painted ones. Eventually, I knew we would need a carpet runner. 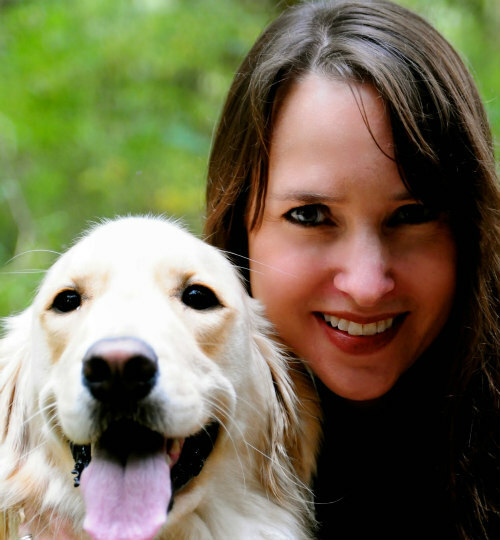 My kids run around in socks all the time and I have to think of my golden retriever, Rosie. Those bare stairs were just too slippery. 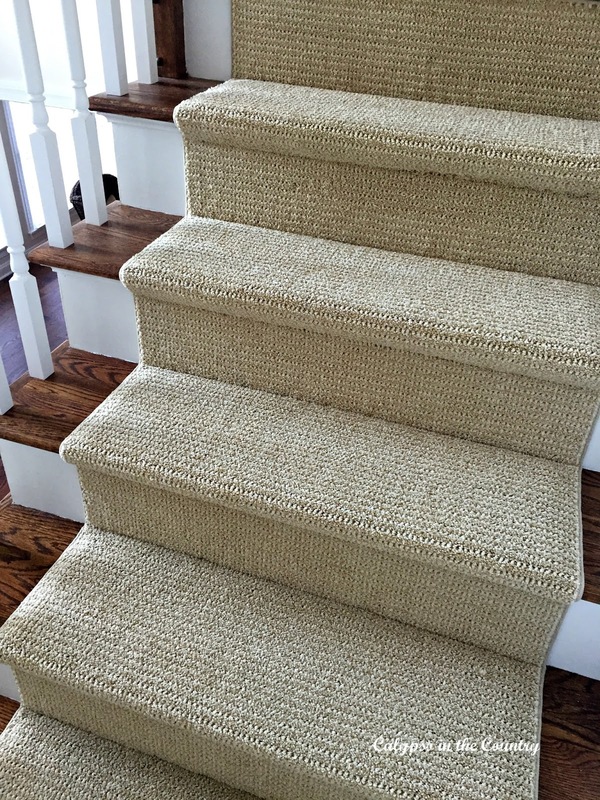 I have always loved the look of sisal or seagrass but we didn’t want the rough feel on our stairs. 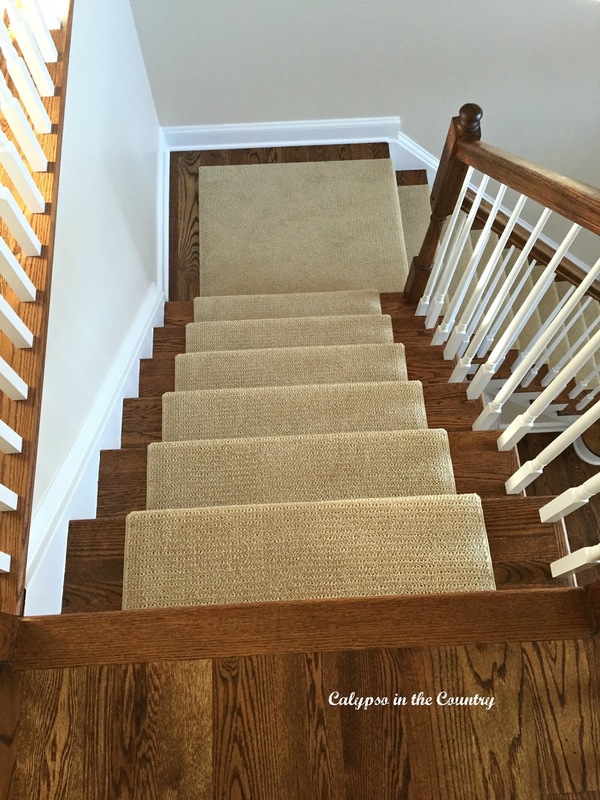 Recently, I shared my stair runner options with you – Choosing a Stair Runner. This carpet is from Masland Carpets and I chose their Sisaltex line in the color Indochine. I am not being compensated in any way to mention them, in case you were wondering. This is definitely the look I wanted for the stairs. 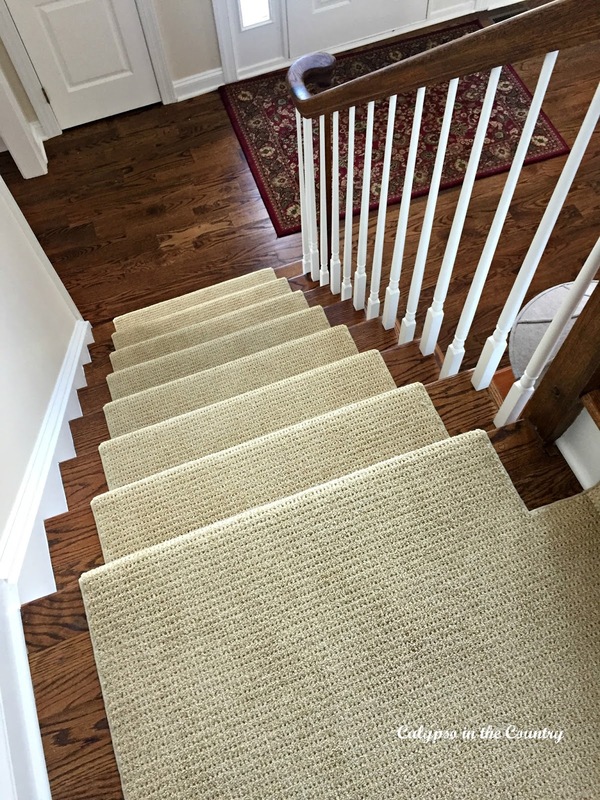 We were able to choose the width we wanted and they cut the carpet to our specifications. 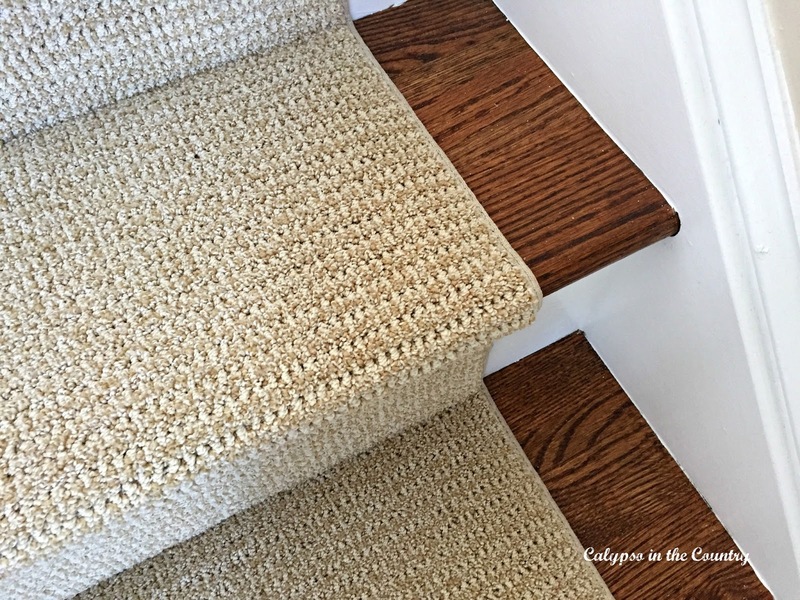 Our stairs are 41 inches wide (above the landing) and 39 1/2 (below the landing)…I never realized that until we measured for the carpet…weird. Anyway, we had the carpet cut at 31 inches wide. My husband isn’t sure if he wants the runner because he (the previous carpet lover) got used to the look of the wood floor up here. We’ll keep it up here for now though. 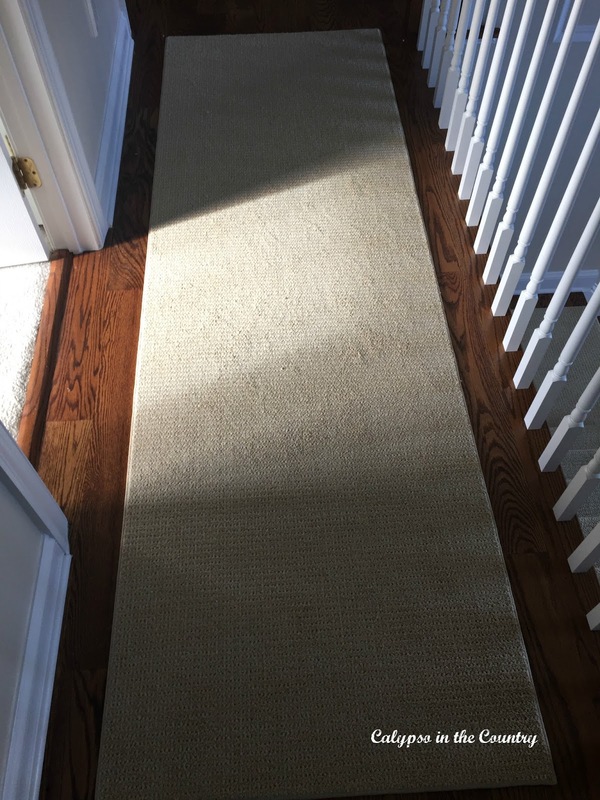 Not only does it match the dog but the runner is neutral enough to work with the existing foyer rug…or something else if I decide to change it! That’s one more thing I can cross off my list! On to the next project! If you want to catch up with all my recent renovations, click over to My New White Kitchen Reveal and Links to All the Renovation Details. And if you are looking for more rug inspiration, visit my post, Area Rug Ideas for Every Room. If you have stairs, do you have a runner on them? Gorgeous! Love the runner too!!! Love it. I know a lady who brought carpet samples home and threw golden retriever hair on them in order to choose her carpet color! It looks amazing and really so pretty. Love it. Your stairs look fabulous, Shelley. I love the new sisal-look runner. What a great choice! Looks beautiful! When do we get a house tour??? Love it, Shelley. Great choice! Ooohh! 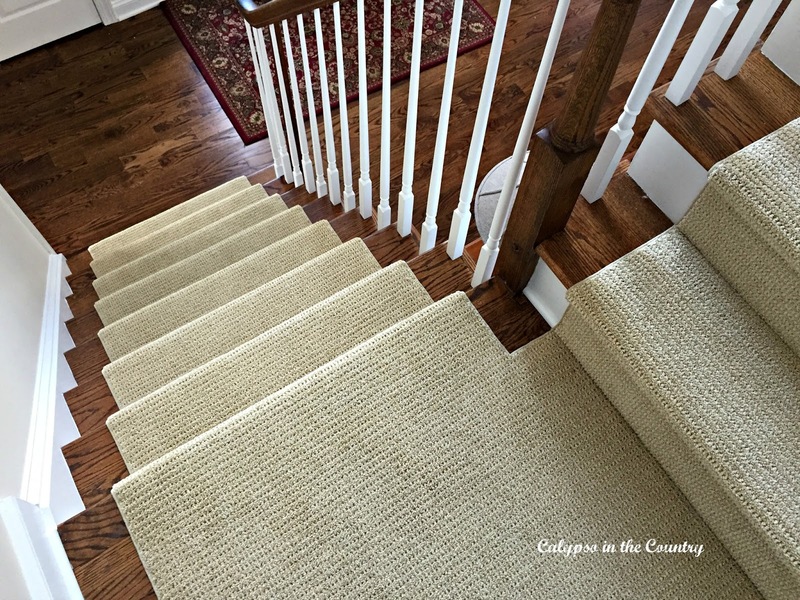 Your runner had me totally fooled – it looks just like sisal! At some point I need to redo the carpet on our stairs and I'm loving having this as a resource! Thanks Whitney! The stain is Minwax Provincial on Red Oak. Looks beautiful. Love the white spindles too! We are in a rental with wood stairs and the animals and us slip a lot. Wish we could have a runner. 🙂 Thanks for linking up to The Creative Circle. No stairs for us, but I really like the look of the runner you chose! Whoa it looks so much like the real thing! I LOVE it. You did a great job Shelley. This is just the idea I have been looking for. Our basement stairs are farmhouse style, painted white wood, and they need a runner. I wanted something neutral, not too prissy or too rustic. I'll be looking for this at the local carpet store this week! Your new carpet looks terrific! The project that you've just finished is one that I need to tackle. Our stairs have mint green carpet from the previous owner vintage 1970's that needs to go! I really like your runner – it looks great! Nice! Sorry for the delay – yes, definitely try the sample in your house to make it works with your surrounding colors. It is holding up very well. I don't see any wear and tear on it and I have two boys and a golden retriever! Yes, we have a pad underneath. It is a thin one – I think maybe like a felt type. Hope that helps! Did you put underlay under it? If so did they staple it on the sides? Yes, we have a thin pad underneath. At first they didn't staple the sides because they said it will flatten over time but I was nervous with my kids and dog so I had them staple the sides before they left. Thanks for the tip!!! Looks great! It looks amazing!!! Found your story on pinterest, we are looking for a runner for our stairs for our Newfoundland 🙂 did you have to have the carpet bound on the sides before installing it? Just curious as it looks amazing and I would love this look for our house! 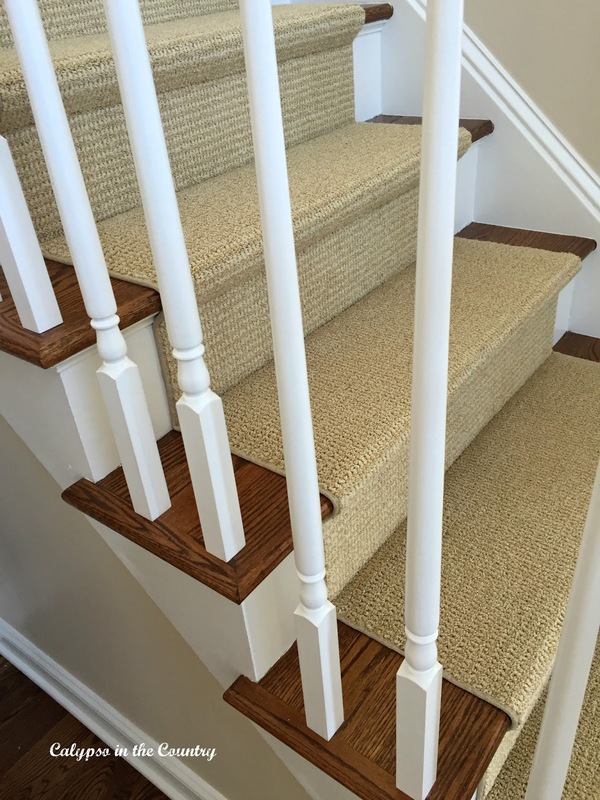 Also we have winder tteads as oyr stairs go around a corner, so im guessing we woild need to custom cut each triangular corner stair tread area and have those bound, too… thanks so much for sharing your fabulous update and gor anh information you can provide! Thank you, Karen! 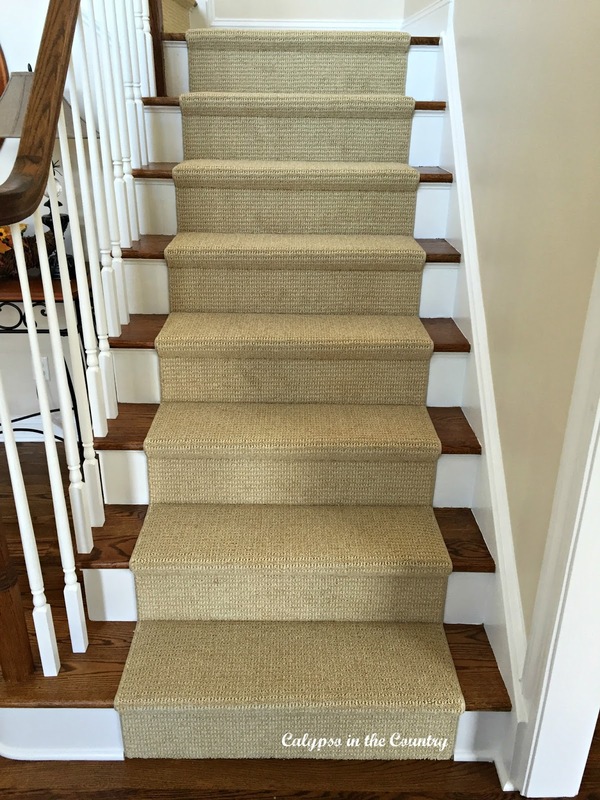 Yes, because it is a carpet and not technically a stair runner, we were able to have it cut down to the size we needed and had it bound. Hope that helps! Thanks for stopping by! What is the carpet made up? Does it clean well?. I love the look! Thanks, Kate! The carpet is Sisaltex by Masland and is made of nylon. It hasn’t really showed much dirt yet. I haven’t had it professionally cleaned yet but so far, so good! 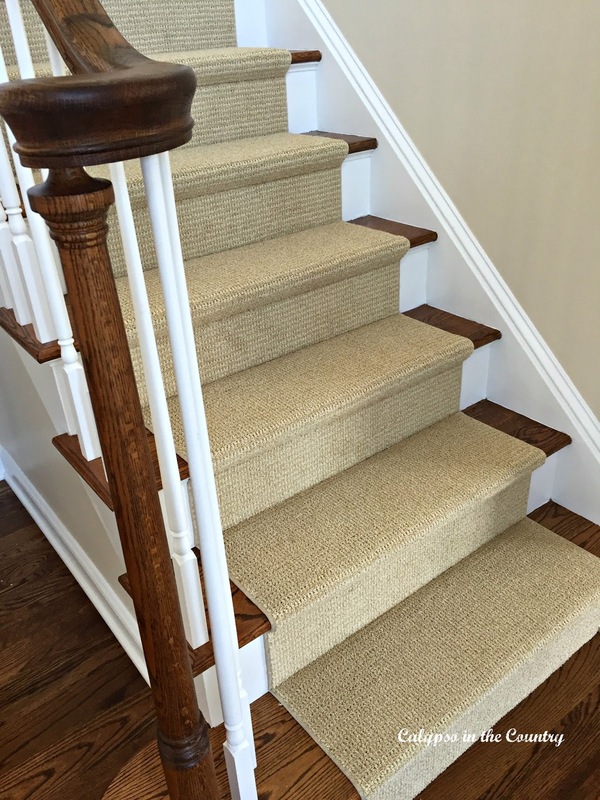 So, this was not a typical ‘off the roll’ carpet runner but a “broadloom” that the company cut into lengths and added binding for your Hollywood style stair carpeting? Did they give you one long length or a few that you put together during installation? Do you also have padding beneath? That’s correct, Deb. Since it was a regular carpet, they could cut it to whatever size we wanted. I believe when the installer arrived, it was in a couple pieces. Yes, there is a thin padding underneath. Hope that helps!